On Saturday night I went out for a meal with some friends. We haven't been out in such a long time and I honestly can't remember the last time I saw them both. How terrible is that! I'm really happy about the seasons changing. I love Autumn and the warm rich colours. 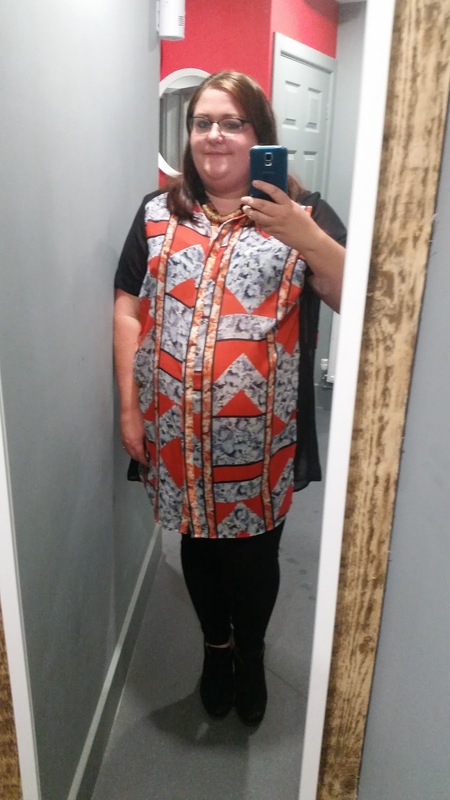 I decided to dig out this shirt dress from Tesco that I got in the sale last year. It's fairly sheet and I went out of my comfort zone and didn't wear a cami underneath it and I felt good in the outfit. Even when my friend offered to lend me something to wear when she discovered I hadn't take anything else to get changed into. I didn't let if bother me and I tried not to show that I found it funny she wanted me to changed. He face was a picture when we met our other friend who complimented me on it. Fashion and taste vary so much from person to person, perception of flattery varies from eye to eye. If you like something and you feel good wearing it then wear it. I love this shirt dress, it's a bit of a bright and obnoxious print but 's ind it really comfy and it reminds me of a bowling shirt from the 80's. I feel like I've seen something similar in a film. What do you wear to make you feel Autumnal?